Skilled craftsmanship and pride may be seen as characteristics of a bygone age of architecture; yet with our celebrated Heritage Collection, these qualities have been brought back to life. With exteriors inspired by the Arts and Crafts movement, The Oxford + looks the archetype of a classic English home. Yet once inside, the 21st century lifestyle it has been designed for is evident. Chic interior design placed alongside contemporary appliances and features all contribute to making The Oxford + a home in which the modern family can enjoy an unrivalled lifestyle. With 4 bedrooms, 1 of which enjoys the luxury of an en-suite, there is plenty of room for the whole family to live together comfortably. 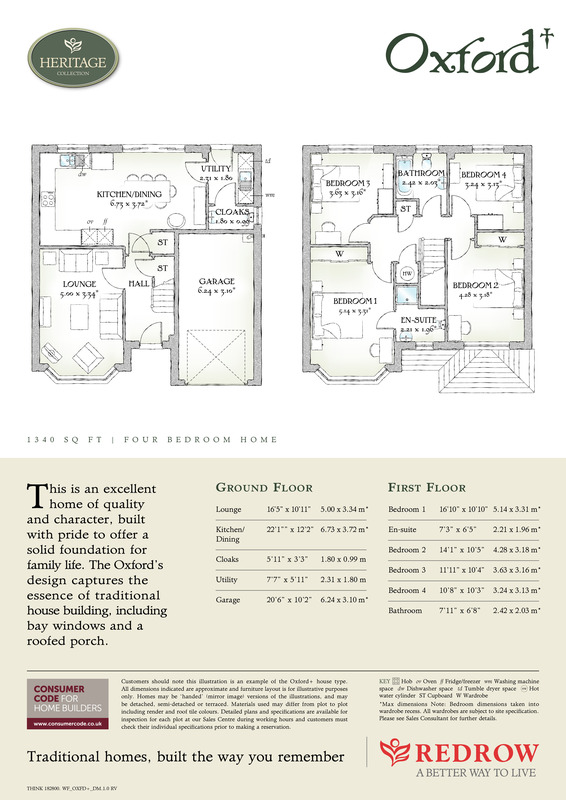 A home of character and quality, The Oxford + could be the new home of your dreams. Lying just to the west of Cardiff, within easy reach of the city and the M4, Tinkinswood Green has much to offer for both work and leisure. Yet it still enjoys the simple rural pleasures of a small village, surrounded by delightful Vale of Glamorgan countryside, giving you the very best of both worlds for you and your family to enjoy. With a good local primary school within walking distance, a major retail park close by and excellent road connections, this is bound to be a popular development. So register your interest today to make sure you are the first to know when new plots are released. The development is just a few minutes away from Culverhouse Cross, where you’ll find a large Tesco store as well as an M&S food hall. For GPs, register with Westway Surgery (Sat Nav: CF5 5LQ, call , while dentists can be found at Fairwater Green Dental Practice (Sat Nav: CF5 3BA, call . Merricks Bar and Restaurant at Cottrell Park Golf Resort is well worth a visit for a great night out and a low cost taxi home, while the children will enjoy a trip out to one of the many popular family restaurants at the Culverhouse Cross retail parks, including Burger King, Pizza Hut, also the Hangfire Smokehouse which is located in Barry. Other local eateries worth investigating include the Indian Marigold, The Traherne Arms, the Three Horseshoes, the Aubrey Arms and the Beech Tree Inn. Nearby Cardiff boasts some excellent restaurants for that special occasion, including the top rated French cuisine at The Pot, the traditional British food at The Clink, along with the many restaurants of the brewery quarter. For a romantic evening, dine at the water’s edge at Mermaid Quay, and don’t miss the a la carte afternoon teas at Tempus at Tides in Cardiff Bay. As with many small Welsh villages, the local primary school, St Nicholas Church in Wales primary, is at the heart of village life, with most local pupils attending. As an alternative, Peterston-Super-Ely Church in Wales Primary is just a mile and a half away. Both schools are rated ‘good’ by Estyn. Older pupils will need to travel a little, to either Cowbridge Comprehensive, or St Richard Gwyn Catholic High School, but there are regular buses. Once again, both schools are rated ‘good’. The Cardiff area also provides a selection of Welsh language and independent schools as part of your education choice. There’s something for everyone within easy reach of St Nicholas, from breathtaking mountains to beautiful beaches. Cottrell Park Golf Resort is even closer, offering superb facilities including two championship courses, a fine restaurant and more. Head south to the seaside fun of Barry Island where the fairground has been drawing the crowds for almost 100years, or head north to the wide open spaces of the beautiful Brecon Beacons national park. Plus, of course, there’s Cardiff, one of the fastest growing and most vibrant cities in the UK, right on your doorstep. Enjoy international rugby action, big name concerts, test cricket, Championship football and so much more, plus theatres, multi-screen cinemas, friendly bars and lively nightclubs – all within the compact city centre. Culverhouse Cross, just a mile from the development, is one of Cardiff’s main retail centres, with no less than two retail parks (Vale Gate, Brooklands and Wenvoe) in one easy to reach location. The parks have everything from M&S to diy, furniture to fashion. Cardiff city centre has even more to offer, with a choice of six historic arcades, the brand new 1.4million sq ft St David’s Shopping Centre and the pedestrianised Queen’s Street. For a more sophisticated shop, take a stroll around the delightful independent stores and boutiques around Cardiff Bay. The development lies just off the A48, with the A4232 trunk road, connecting Cardiff to Junction 33 of the M4, just a few minutes drive away. Cardiff is around 6miles to the east, with Cowbridge around 6miles to the west. Newport is 23miles, Swansea around 40miles and Bristol 55miles. Merthyr Tydfil, gateway to the Brecon beacons is around 23 miles to the north. There are regular busses connecting St Nicholas with Cardiff city centre, with trains from Cardiff connecting to London in around 2 hours. Cardiff Airport is just over 7 miles to the south. 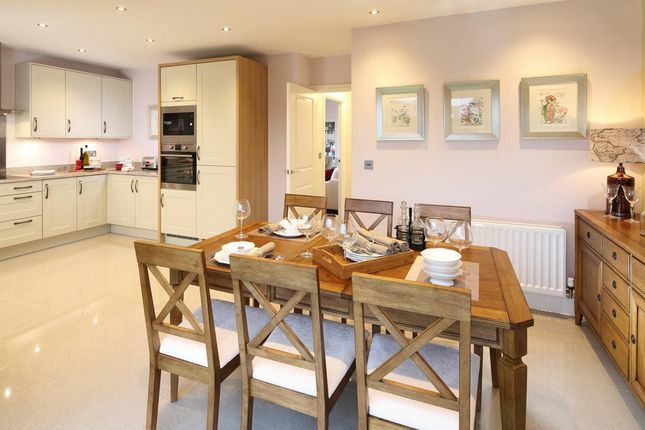 Property descriptions and related information displayed on this page, with the exclusion of Running Costs data, are marketing materials provided by Redrow - Tinkinswood Green, and do not constitute property particulars. Please contact Redrow - Tinkinswood Green for full details and further information. The Running Costs data displayed on this page are provided by SmartNewHomes to give an indication of potential running costs based on various data sources. SmartNewHomes does not warrant or accept any responsibility for the accuracy or completeness of the property descriptions, related information or Running Costs data provided here.